Who invented the Telephone? The name of the person credited with inventing the Telephone is Alexander Graham Bell (1847 - 1922). Alexander Graham Bell is not only famous as the Scottish inventor of the Telephone but also as a scientist, engineer and teacher of the deaf. When was the Telephone invented? Alexander Graham Bell invented the Telephone in 1876, during the Second US Industrial Revolution / Victorian period of invention (1850 - 1914). The invention of the Telephone originated in Scotland is considered a prominent achievement in the field of Communications and Technology. Definition of the Telephone: The Telephone is defined as electronic equipment that converts sound, specifically the human voice, into electrical signals that can be transmitted over distances and then converts received signals back into sounds and transmits speech. Fact 1: Who invented the Telephone? The Telephone was invented by Alexander Graham Bell in 1876 during the Second US Industrial Revolution era of inventions (1850 - 1914) that revolutionized Communications. Fact 2: Who invented the Telephone? Prior to the invention of the Telephone in 1876, communication were slow and none transmitted the sound of the human voice. The history of communications over a distance probably began with the invention of smoke signals. Flags were also commonly used as a form of distance communication. Fact 3: Who invented the Telephone? The Telegraph was the immediate predecessor to the telephone. The telegraph was invented by Samuel Morse (1791 - 1872) in 1838. Fact 3: Who invented the Telephone? The invention of the telegraph was a massive success enabling a message to be sent instantly down a wire across long distances. The invention of the telegraph was seen as the 'last word' in communications. Fact 4: Who invented the Telephone? People believed that such a system could never be bettered, that that the addition of voice transmitted messages were a waste of time, a novelty. However, the British inventor Alexander Graham Bell had other ideas and this led to his invention of the telephone in 1876. Fact 5: Who invented the Telephone? The history that led to the invention of the Telephone started with the ability to harness and produce Electricity. The "invention" of electricity enabled Samuel Morse to develop the telegraph system which transmitted signals by using electrical devices to send signals by a wire. Fact 6: Who invented the Telephone? In 1831 Professor Joseph Henry of the Albany Academy in New York demonstrated that electricity could be used to ring a bell from a distance. Fact 7: Who invented the Telephone? Another inventor who contributed to the development of the telephone was the Italian inventor Innocenzo Manzetti (1826 - 1877) who discussed the idea of a "speaking telegraph" in 1843 but did not pursue his idea at the time. Fact 8: Who invented the Telephone? The inventor of the Telephone, Alexander Graham Bell, was born on March 3, 1847 in Edinburgh, Scotland died on August 2, 1922. Fact 9: Who invented the Telephone? The early years of Alexander Graham Bell were spent in Edinburgh, Scotland where he was raised by his family. His mother was Eliza Grace Symonds and his father was Professor Alexander Melville Bell a famous elocutionist speech expert and teacher. Fact 11: Who invented the Telephone? In 1863 his father, Professor Alexander Melville Bell, took his young son to see an "automation machine" or "speech machine" that imitated the sound of the human voice. This sparked the interest and imagination of Alexander Graham Bell and he followed in his father's footsteps and began to study language and speech. His goal was to produce speech electronically and he and his brother Melville began experiments based on this idea. Fact 13: Who invented the Telephone? The brothers invented the 'Visible Speech System' using phonetic symbols to help the deaf in learning to speak. Fact 12: Who invented the Telephone? Alexander Graham Bell was educated at University College, London but suffered with health issues. His older brother Melville died from tuberculosis. His father also contracted TB and decided to move the family to Canada in 1870 to recuperate. Fact 13: Who invented the Telephone? In April 1871 Alexander Graham Bell moved to Boston in the United States to teach the 'Visible Speech System' to the deaf. In 1872 he opened a school for the "Vocal Physiology and Mechanics of Speech for deaf students". His most famous student was Helen Kellar who was referred to Alexander Graham Bell when she was just six years old. Fact 14: Who invented the Telephone? In May 1874 Alexander Graham Bell began experimenting with the Phonautograph, the earliest known machine for recording sound, that had been invented by Edouard-Leon Scott de Martinville in 1857. These experiments led Alexander Graham Bell to inventing the telephone. Fact 15: Who invented the Telephone? Alexander Graham Bell hired an assistant named Thomas Watson (1854 - 1934), who was working in an electrical shop in Boston. Fact 16: Who invented the Telephone? During one of Bell's experiments Thomas Watson accidentally plucked one of the metal reeds on the Phonautograph machine that showed that sounds could be transmitted. Fact 17: Who invented the Telephone? Further experiments led to invention of the Telephone. Alexander Graham Bell submitted a patent for his invention on March 7, 1876 and the U.S. Patent Office issued patent number 174,465 for the telephone. Fact 18: Who invented the Telephone? On 10 March 1876 Alexander Graham Bell made the first successfully transmitted speech to his assistant saying "Mr. Watson, come here! I want to see you!". It is likely that Bell had heard a noise over the wire and called to Watson, but Watson had heard Bell’s voice through the wire and therefore received the first telephone call. Fact 19: Who invented the Telephone? Reaction to the invention of Alexander Graham Bell's invention of the telephone was somewhat sceptical. Western Union, the major player in the telegraph industry refused Bell’s offer to buy the patents to the telephone believing it was just a novelty. Fact 20: Who invented the Telephone? On July 11, 1877, Alexander Graham Bell married Mable Hubbard, a former student and the daughter of Gardiner Hubbard, his initial financial backer. Fact 22: Who invented the Telephone? 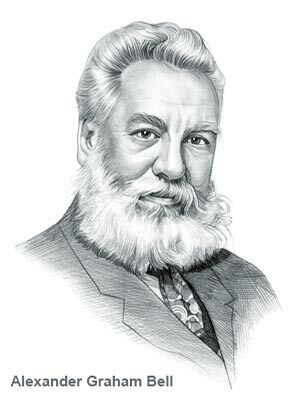 Alexander Graham Bell also continued his work with the deaf and established the American Association to Promote Teaching of Speech to the Deaf in 1890. Fact 23: Who invented the Telephone? In January 1915 Alexander Graham Bell made the first transcontinental phone call from New York speaking to Thomas Watson in San Francisco. Fact 24: Who invented the Telephone? Alexander Graham Bell died on August 2, 1922 at Baddeck, Nova Scotia, Canada. He will forever be remembered as the inventor of the telephone. It was nearly 100 years after the invention of the telephone that Martin Cooper invented the Cell Phone in 1973. The Smartphone was invented in 1992 at IBM.